Nakabayashi Chikutō was a prominent Edo-period painter born in Nagoya, the capital of Owari Province (modern-day Aichi Prefecture). As a self-proclaimed literatus, Chikutō advocated for a strict adherence to Chinese stylistic precedents. This conservative attitude is evident in his various treatises and commentaries on the subject of painting. He directed his most withering criticism towards the followers of Maruyama Ōkyo (1733–1795) and their meticulous naturalism, which he denounces as merely ‘crowd pleasing’ frivolity. 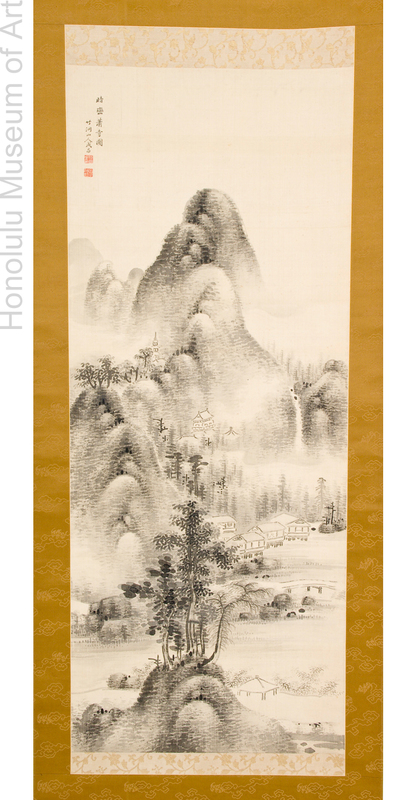 In a reference to the “Six Principles of Chinese Painting” postulated by the art critic Xie He (act. 5th century), he further finds the brushwork to be “lacking in bone,” referring to improper use of the brush. In this particular work, the painter reveals his fidelity to the techniques and themes of Chinese literati landscape painting. Like his influential predecessor, Ike Taiga (1723–1776), Chikutō’s style was strongly influenced by the Chinese Northern-Song-dynasty painter Mi Fu (1051–1107). The horizontal, bean-like strokes that Chikutō uses extensively throughout the composition are now referred to as “Mi dots,” since it is widely believed that Mi Fu originally popularized this form of mark-making. Paul Berry, Michiyo Morioka. “Literati Modern: Bunjinga from Late Edo to Twentieth-Century Japan.” Honolulu: Honolulu Academy of Arts (2009), p. 284.